Jibbering Musings » Where are all the Web Testers? Where are all the Web Testers? There seems to a problem on the web, there aren’t any testers. Yahoo has been scootling up lots of really intelligent people, I’ve met them, I’ve seen what they can do. Yet they seem to be releasing sites to the public that have obviously not even had the most rudimentary testing, sure they call them Beta’s, but they’re not even alpha quality. Do they simply not hire a Test team, or are the test team just no good? 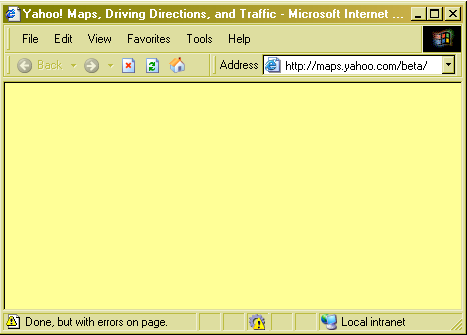 Yahoo maps arrived a couple of days ago, I got nothing but a blank page using Internet Explorer 6 on Windows XP service Pack 2, see the image. I can’t understand how any tester managed to not raise the bug, and as it’s a complete failure of the site and a 2 minute 100 character fix for the developer it surely would’ve been fixed if it had. 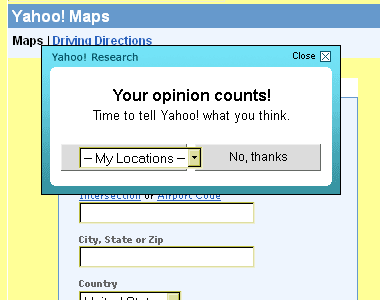 Then on the front page of the maps site, I get another obvious problem, there’s a little popup feedback request button, which I can’t click the yes please button as it’s positioned right on top of a select element which bleeds through - the bug is obvious and serious, the fix is trivial, yet it’s released in this state. I’m not running some weird browser, I run regular IE with just font-size set to smaller, and flash disabled in the manage add-ons, and my background colour a nice yellow, you’ll note the tester missed the failure to set a background colour too of course. Yahoo aren’t the only people to not bother with testers, they’re just the people that triggered this rant. Developers generate bugs, any of the testers who’ve worked with me know I generate lots of them, fortunately testers find bugs, and together you get a good product, it seems that in too many places this is simply broken. Now I’m sure you’ll all be thinking, come on these bugs are silly, who really cares about people who disable flash, or if they can’t click on a survey link? It works fine for normal people. However these aren’t the only bugs that the Yahoo testers have missed, there are others, anyone got a security contact for yahoo? Err. I don’t really get it; why do you keep complaining about the yellow background everywhere? First, you set your background yellow, then you blame websites for not setting a white background. Like, you set your background yellow, and then you expect everyone to set it back to white? Do you want it yellow or not?? The problem is not the people not setting the background colour. The problem is when you set the foreground colour, you must also set the background colour. The CSS validator warns of it, WCAG warns of it, and it’s obvious, you can’t just set one colour and assume it will work. >Do they simply not hire a Test team, or are the test team just no good? No, they just haven’t prioritised fixing this bug yet. It’s all about releasing early, releasing often. Adrian D, So you would say Yahoo released the Maps Beta knowing there was an XSS security exploit in it (see the next entry), but they decided not to “prioritise” such a bug. Now I’m willing to give Yahoo the benefit of the doubt and that they are merely not testing, rather than deliberately choosing to risk our data by leaving trivial exploits in their code. what’s the purpose for the developer to set the background color in their code? i think the only reason would be for design reasons. maybe yahoo didnt set a background color in their code because they respect the user’s browser settings. btw, im a bit color blind and the font color you chose for the calendar and top links are not readable. i can’t change my background color in my browser because you set it to white. where are the testers? The reason is because they set a foreground colour! If your foreground colour is black, and the users chosen background colour is black, then the user cannot see anything. If yahoo respected the users settings, then they wouldn’t've set a foreground colour either, as if you set one, you must set both, it’s very simple. Sorry to hear you can’t read the colours in the calendar, I wasn’t actually aware of any grey/white colour blindness. To overcome this you should set both foreground and background colour to something you like, that’s easy to do in all major user agents, in IE just set “ignore colors” in the tools - internet options - accessibility, or in IE or other user agents, use a user stylesheet with !important rules on the colours.